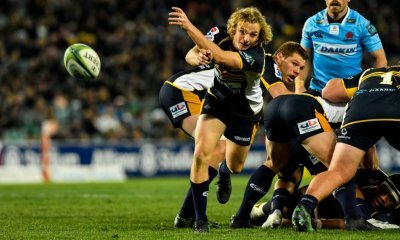 The ACT Brumbies travelled to Melbourne to take on the Rebels in their quest to secure their position at the top of the Australian Super Rugby conference. Welcoming back several injured players, the Melbourne Rebels went into this match full of intent. They touted do-or-die battle with the ACT Brumbies as their “Grand Final”. Certainly, with a tough final 6 games left in their fixture, a loss here to the Rebels would all but rule out a finals berth in 2016. 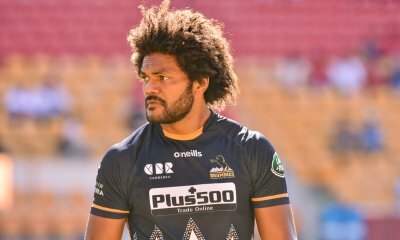 The Brumbies came into this match without experienced backs Joe Tomane, Matt Toomua and Robbie Coleman. This paved the way for some rookie Brumbies, including James Dargaville at inside centre, to show their wares. From the kick-off, both teams were showing their intent, with possession changing hands several times. After seven minutes and attacking phases close to the Rebels’ line, a penalty to the Brumbies gave them first points. Christian Leali’ifano slotted an easy penalty from near in-front. Jack Debreczeni missed a certain penalty kick not long after, but the Rebels didn’t have to wait long to score. In the 10th minute, after some sublime attacking play found Debreczeni break the line, passing on to Cam Crawford, who touched down under the posts. It was not long after the Brumbies hit back with a Try. The Brumbies used their patented rolling maul, from a line-out close to the Rebels’ try line, giving David Pocock the 5 points. 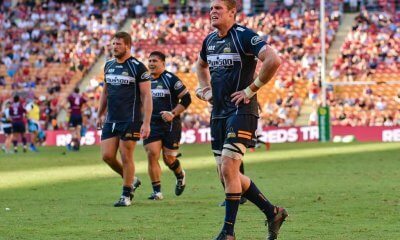 The Brumbies kept hammering the Rebels’ defence, and while vastly improved since their previous match, the Brumbies managed to find the chalk again. Rory Arnold collected the ball off a ruck, and crashed over in the 32rd minute. The Brumbies scored another try in the 37th minute, to further extend their lead. Rookie Centre James Dargaville set up Christian Leali’ifano, who crossed for an easy try. Sensing there was a forward pass in the lead-up to the try, Leali’ifano took a quick, but unsuccessful, unsuccessful drop-kick conversion attempt. This ruled out the possibility of a TMO review of the try. This is a loophole Bernard Foley rued not taking the previous week in the Waratahs win over the Cheetahs, missing out on a 3-try advantage bonus point. In a fairly fast-paced first half, the teams went into the sheds with the Brumbies comfortably ahead 20-10. The Rebels must have been given a stern talking to by Head Coach Tony McGahan at half-time, as they came out firing. Five minutes into the second half the Rebels were first to fire a shot with Reece Hodge scoring in the corner, with Debreczeni managing to add the extras. Not to be outdone, the Brumbies moved the ball around to find Scott Fardy in the corner in the 52nd minute. Sefa Naivalu also found the chalk for the Rebels in the 57th minute, both conversion attempts unsuccessful. In the 68th minute, it looked for all money that Brumby Allan Alaalatoa had scored a cracking try. Before Leali’ifano managed a quick conversion, this time TMO George Ayoub stepped in and reviewed the lead-up to the try. He ruled a knock on, disallowing the try. Perhaps it was late justice for the Brumbies forward pass try in the first half. However, the Brumbies managed to find the try line via Nigel Ah Wong in the 71st minute. The Rebels valiantly tried to hit back, but it was not to be and the final score was 30-22 to the boys from Canberra, scoring 5 tries to 3. The Rebels looked like a much more well-oiled machine this game, their defences tighter and they were willing to throw the ball around in attack (with minimal handling errors). However, the Brumbies more than had their match in the forwards and come scrum time they dominated nearly every time one was packed down (the much-maligned AAMI Park turf has not improved greatly, by the way). Combined with a bench full of impact, the Brumbies had more to give and while the Rebels stayed close, in the end, it wasn’t close enough. This game was won in the forwards, notably the Brumbies scrum dominated the Rebels’ set piece time and again. While the Rebels were menacing in attack, they came unstuck at the breakdown and the experience of the likes of Stephen Moore, Scott Fardy and David Pocock showed when it mattered. Take your pick from any of the Brumbies forward pack (including the reserves), they were all solid, though no real stand-outs, even Pocock had a fairly quiet night (by his standards). I’m going with Sean McMahon, though, he never gives up, leads by example and should, for mine, be handed back the Captain’s key to the Melbourne Rebels. For the visitors, Tevita Kuridrani had a relatively quiet night at 13, but did enough to prove the outside centre jersey is his. Christian Leali’ifano controlled the play well, but Wallabies coach Michael Cheka would be concerned about his kicking success rate. For the Rebels Sean McMahon has proved yet again he has to have a place somewhere in the Wallabies and rookie Reece Hodge, while not ready for the green and gold just yet, has shown he is a future Wallaby. It was a really entertaining game even if it was a bit scrappy at times. I thought Fardy was a clear standout, forcing turn overs at important times plus scoring a try, he was my motm. Rebels pack turned over again at scrum time. With Weeks out makes the loss of Paul Alo Emile to France even worse. James Hagen does not cut it for me at TH. Ireland must have been really hard up at the time for him to be capped. At least we tackled this week. Agree fully on the props. Would be great to see Paul Alo Emile come back. Rebels are moving forward though and a team on the up. I wonder what will happen when the contracts of PAE, Pyle and Higgers end. Will they return to the Regels or seek their fortunes elsewhere. We could sure do without them. With them or without them? I was pretty happy with all of their contributions and would love to have them back in the mix!! Definately with. Either my typing is crap or the predictive text kicked in probably both. Pyle has resigned in France all ready, will be playing for the Frogs in the 2019 RWC is my prediction. Would love PAE and Higgers back. Ruan Smith man of the match. I didn’t realise he was picked as the reserve 10. 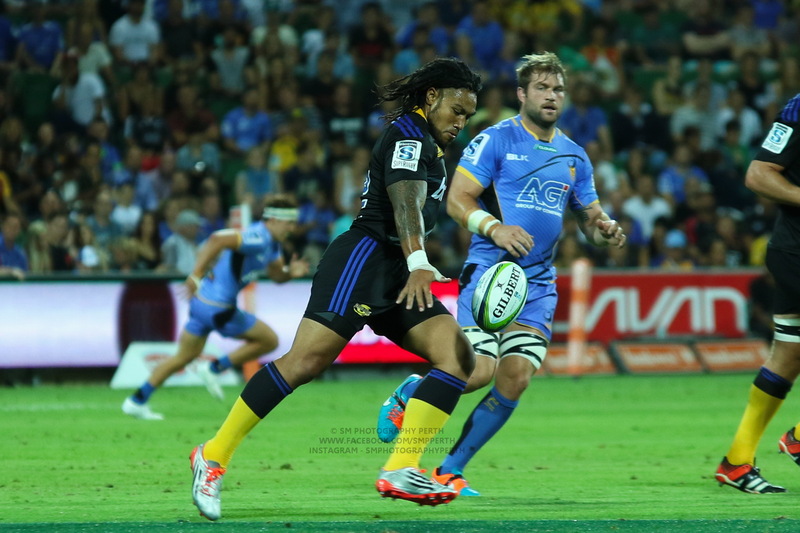 The turning point in the match was the clearly forward pass leading up to Leali’ifano’s try. He knew it – slowed down as he approached the try line expecting to be called back; took the quick shot at goal before an official could say anything. Poor officiating by ref and TMO. And Allan A’s try should have been allowed. You could see clearly that it was stripped by the Rebels player. Ref had the call right originally with the play on call. Swings and roundabouts. The sublime rugby in the lead up to that try was worthy of 5 points. Not sure the first scrum penalty against the Rebels was correct but the Brumbies went on to dominate the scrum for the rest of the game and kept ref out of it. Both sides were consistently offside but rarely penalised. What were the touchies looking at? And that pass was clearly forward and shouldn’t have needed the tmo to spot it. McMahon outplayed both Pocock and Fardy. Actually so did Faainga. I used to think Luke Jones should be a Wallaby. I don’t think that anymore. Stirzaker is clearly the best young scrum half in Aus rugby and should be nurtured by Chieka. Timani had a great game. Jack D showed some good skills but someone should have slapped him when he asked to kick a penalty from half way. Ellison continues to give structure to the backline. Harris and Hodge gave us a bounty of playmakers. And how fast is Naivalu? Meehan was a liability when he came on and Leafa maintained the quality of his throwing. Placid wasn’t missed. You mean the Naivalu who got run down by Fardy, I have no doubt his fast, but this wasn’t a game he showed it. I think his lost a bit coming back from injury. Really a good game. Agree on McMahon and hopefully Cheika is looking at him closely especially vis-a-vis Hooper. I was suprised the Brumbies dominated the scrum and it looks like Alexander may finally have come of age (albeit Holmes and Weekes must be the best TH ). I think you are being a hard on Jones , looking at the replay he was injured ( I think back) in a scrum collapse … plugger still substituted Timani and Jones continued to do the hard yards …again playing a full 80 ….something many others at this level fail to do . The Rebels had their chances but still seem a work in progress that is moving in the right direction . A terrific game though …and loved that Rebels lineout play it was a real gem and Fardy continues to prove his worth for the Brumbies . The only people who didn’t see the forward pass were the officials. Skelton was all four of them. What really shits me about the disallowed Brumby try. Is that Fardy had his knee on the ground when it was stripped out… This was called by the referee in real time! So any subsequent, “knock forward” should have come back to the tackler not releasing Fardy before trying to take the ball… But the two referees were there and the ball was clearly reefed back by the Melb Rebels player… It was not lost by Fardy, but pulled out. This was a clear make up call for the Brumbies exploiting the dumbest loophole in history, which is a conversion attempt nullifies the ability of the TMO to intervene on tries alllowed. What next? Returning the ball to the umpire in cricket before the batter reviews to prevent him being able to? They are already took our concussion substitute rule for a game that will never really need to use it. Also regarding the Wallaby Watch and Lilo’s kicking, he was 84% before the game started and its Foley’s job is his to lose, so I hardly think Cheeks will care. I also don’t think TK did enough, he is going the way of Nonu… last year he was a bit up and down in super rugby too. Fardy was a clear MOTM for me, Colby was great for the Rebels too, they should have subbed Thompson for Reid if they were serious about causing the Brumbies head aches at the end. Rebels played well but waited for Brumby errors, where the brumbies would have gone in and given away penalties if they didn’t take steals. A highly skilled game (best aussie derby in that regard yet) with that tactical difference and scrum dominance the main differences in the teams. Conversely, the rules have to change to NOT allow an immediate drop kick for goal before the TMO has ruled on forward passes etc. beforehand. Pass for the Brumbies try was borderline and probably forward. Certainly the Brumbies thought so. One thing to consider is if they make any changes to the ability of team to take a quick conversion, then teams who are chasing a game and are against the clock will suffer unduly for no reason. The rules need to be changed around the officiating of a try, and the impact of replays. I would suggest that a simple process of the referee, once he believes a try is scored, he either awards the try, and its unreviewable, or once he blows for time off, they have a set time, say 15 seconds to consult with his AR’s,and if they have doubts his must refer within the 15 seconds, or the try cannot be reviewed by the TMO and can only be decided by discussion with AR’s. .
You could consider allowing the TMO to request a review on a specific grounds if he sees something real-time, but it must be suggested to the referee, with specific grounds (EG: knock on, lost forward etc – no fishing for reasons or I thinks…) no later than 5 seconds after the try is awarded. This would also eliminate the outside influence of the replays with a 15 second decision / referral window so what could be shown would be limited. Good suggestion, I would keep the first blast of the whistle as a time off signal, then the second, 5 seconds later awards the try or is immediately followed by the review signal. It provides the option of a confirming vote system – EG;: if the AR’s raise their hand within in the 5 seconds it signals they have a question, and / or it allows time for the TMO to interject. I just know from touch rugby the chest wave thing that the referee does to the assistant before the try, normally for forward passes, which the assistant referee hopefully doesn’t call, because I’m dominating. I didn’t say I liked the rule, in fact I said it was a dumb loophole, don’t be throwing ‘conversely’ around under those circumstances…. Good noisy crowd right behind their teams, so much better than the morgue crowds of Sydney..
Stirzaker threw some rubbish passes and appears very low in confidence. Would really like to see McMahon at 7 for the Wobblies sooner rather than later. Great contrast to the Brumbies of 2 weeks ago. They started offloading last week and increased it this week. They are now playing with more instinct and flair and less rigidity and that allowed them to convert pressure and possession into points. Rebs werent far away from them tho. Close to the best game Ive seen from the Aust conference this season. Harris made a difference to them but their forwards just got shaded. Hoping someone can clarify something for me… at about 25min Brumbies, Fardy I think, took a lineout throw and they formed up for a maul, but no Rebels joined to contest the maul. One of the Rebs then ran around the ‘maul’ and attempted to tackle the ball carrier, and was penalised. Commentry (Hoiles I think) explained the penalty in that as long as Fardy doesn’t transfer the ball to another player and as long as the Brums don’t try to advance their maul formation uncontested, then the Rebels have no rights to tackle the ball carrier. Have I understood that right? Don’t think I’ve seen that before. Would love to know why that was a penalty as well. The ball had been moved to the back which meant it’s playable as the Rebels never contested the mall. MST basically has it – the line out was still underway, and while the line out is underway the offside line for players who are in the line out is in line with the ball (and remains 10 m back for the other players). To end the line out from that situation, either the ball had to move from over the area where the players had lined up, or the maul had to form and move off the line along the centre of the line out. A maul isn’t formed until players from both teams join it. That’s why players sometimes can run around the back of group of players on the other team trying to form a maul. I think the reasoning there was the that the lineout itself hadn’t ended (since the Brumbies had remained in place and not advanced) and therefore the offside line at the lineout was still in place. Ordinarily if they had have advanced the Rebels player could’ve gone around and sacked the player in possession. Surprisingly, the Rebels have played worse than tonight and won on a few occasions this season. Their defence was generally good and their set piece backline moves were lethal. Scrum was definitely in trouble but their attacking lineout was an improvement on past efforts. The difference to me was the Brumbies’ ability to get over the advantage line from about 20 mins onwards. The Brumbies have impressive depth to play that well with so many players out injured. What’s critical for the Rebels now is to recognise what they did well this week and not get cowed by the Chiefs. If they play just another level up from tonight they will give it a real crack. Unfortunately, he zipped a few passes to nobody and stifled any chance we had of getting back into the game. And what’s with the man bun??? Who was it that said "there's always next season"? Oh yes, it was me, every year... Played every position in the forwards as a lad, was crap at all of them.